Ronald Maier and Andreas Schmidt together with Christine Kunzmann organized the special track LAYERS Social Knowledge Management at I-KNOW 2015. With the advent of social media, knowledge management had to rethink its conceptual foundations on how knowledge develops on a collective level. Andreas Schmidt opened the session with a look back on how the field has evolved. Ten years ago, at I-KNOW 2005, the very first version of the knowledge maturing model was presented, aiming at integrating diverse perspectives on knowledge, and since then, numerous cross-disciplinary research activities have contributed to the extension and refinement of the model. At the heart is the insight that knowledge develops along distinct phases in which its characteristics and thus requirements for support change. It brings together different perspectives and provides a framework for analysis and design of interventions. The track comprised 6 papers and posters in two sessions which were chaired by Ronald Maier. 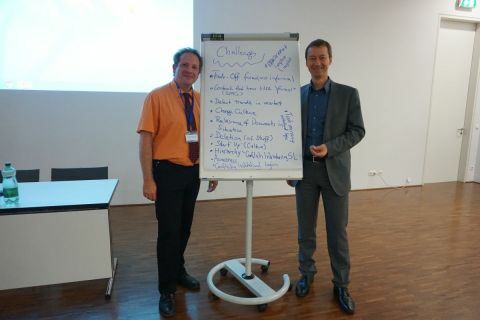 After several inspiring perspectives on the topic of social knowledge management, Andreas Schmidt and Ronald Maier moderated a plenary discussion on remaining challenges in the field. It became apparent that although social media in knowledge management seems to be well established, there are still considerable issues ahead which are well worth exploring. While there are also challenges in the fields of technology, such as detecting relevant documents or support in a specific context (which has been an issue for more than 10 years), a lot has concentrated on more cultural and organizational issues, such as the trade-offs between formal and informal processes and structures, the conflicts with corporate cultures and the conflicts between different institutional logics and whether tools transform culture or should adapt to the culture. Finally, measurement, indicators and what is considered successful social knowledge management was agreed to be a hot topic. This entry was posted in workshop on 21/10/2015 by pablo.